This week has been a whirlwind. It started out with a Biology test on Monday (got a B! ), my Art Final on Tuesday (got an A! ), and a Biology Lab Final on Thursday (don't know what I got yet). Even though my art class is finished and I no longer have any Friday deadlines, I still managed to make some time to paint today. I broke out one of my new 24x48 canvases and got to playing. 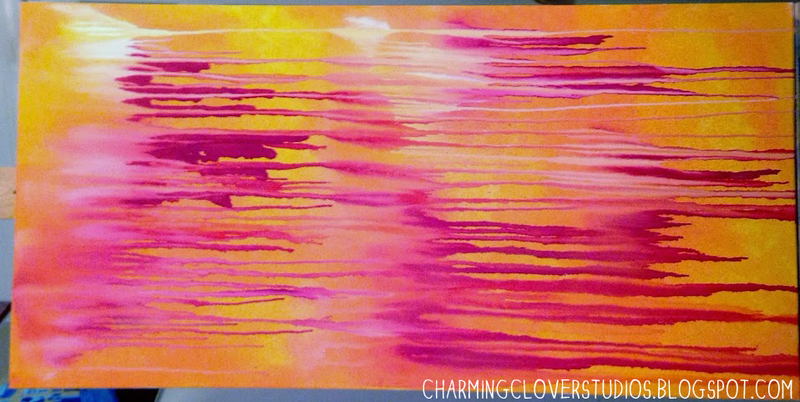 I used acrylic paint for the background and then had fun with some Dylusions Sprays. I'm not sure what direction this is headed in, but it looks fun! I won't have time this weekend to mess with it so it will just have to sit until next week. Maybe it'll speak to me in the meantime. I have two more weeks of classes and then I have 2 days of wonderfully intense Finals. Oh joy. I'm ready for this semester to be over. I'm ready for summer! That's all I've got for tonight folks, y'all have a good one and we'll see ya next time.